Piranha Bar defy reality in new commercial, getting a one year old baby rapping about his nutritional needs for Danone’s Toddlebox.ie platform. 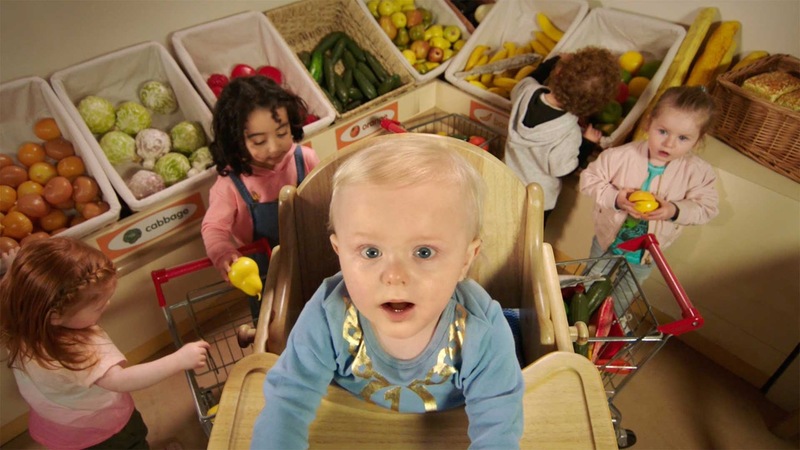 Directed by Richard Chaney, the film sees a range of toddlers, or ‘gangster nappers’, from 0-3 years old spitting bars to demonstrate why their first 1000 days of life are a critical window to gain important nutrition. Created by Dublin-based agency, Chemistry, the spot is shot in the style of an old-school rap music promo. The custom-composed rap song, created by Dunk Murphy and performed by children, introduces the campaign slogan, ‘#YOTO’. According to Piranha Bar #YOTO stands for ‘You Only Toddle Once’ and allows toddlers to express their self-determination and needs in their own voice. The team at Piranha Bar had the complex task of ‘choreographing’ the highly energetic cast of toddlers, who were all under the age of three. Discussing the shoot itself, Richard reveals that the biggest challenge on shoot was gathering the solid base of footage from the 11-month-old ‘hero’ baby – in fact two identical twins. “Getting an 11-month-old to maintain eye contact with camera in the style of MCs and rappers we all know and love, was only possible using an old favourite of documentary makers, the ‘Interrotron’ that allows the baby to see the director’s face through the camera lens.” explains Richard. Post-shoot, Piranha Bar completed full animation and post on the spot employing a masterful face replacement and lip-sync animation in CGI to make the toddler-hero really sing. In order for them to complete the transformation, a photo-real replica CG face was created and animated to match the performance of the child performer who they shot separately. “Achieving a convincing natural look to the singer was all down to our meticulous lighting and compositing artists.” Adds Richard. Toddlebox.ie, created by Danone, is a practical online guide dedicated to educating new parents about the essentials of what to feed toddlers and how to address their unique nutritional needs.